Spread with a lot of pages on the social network "facebook", the timeline became private participations time line and display is causing inconvenience to the majority of users of the social network "Facebook". To solve this company, "Facebook" has recently launched some utilities for users of their application on smart phones. 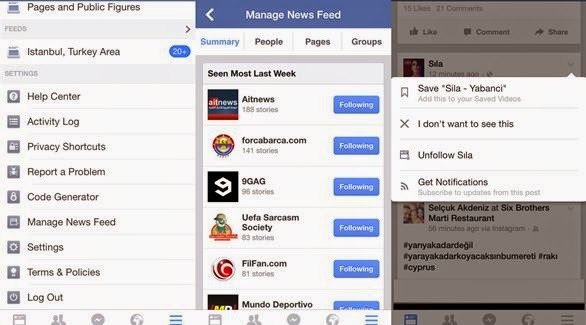 To do this, the user must click on the "More" tab or English-language sign "more, and then the user presses the" latest news management "in English and" Manage News Feed "appears after pressing the pages that has deployed Posts property. As we mentioned this to the users of mobile devices. As for the users, "Facebook" across browsers, they can put pressure on property settings to gain access to non-followers of users, or it can put pressure on the abolition of follow-up renovation Update Who To Unfollow to get more options for help.